Austrian rabbi; died in 1739; son of Eliezer ha-Levi Lichtenstein Ettinger. He succeeded his father in the rabbinate of Holleschau and in the directorate of its Talmudical school, which was at that time one of the most important in Moravia, and at which his brother, the author of "'Edut be-Yosef" (Sulzbach, 1761), was a pupil. In 1717 Ḥayyim was appointed head of the Talmudical school of Lemberg, and in 1730 succeeded the author of the "Pene Yehoshua'" in the rabbinate of that place. Although Ettinger wrote several works and numerous responsa, nothing was published under his own name. Only in the works of others, as, for instance, in those of his brother-in-law, Ḥayyim Cohen Rapaport, rabbi of Lemberg, may there be found a few scattered responsa and notes of Ettinger's, which give but slight indication of his Talmudical knowledge. 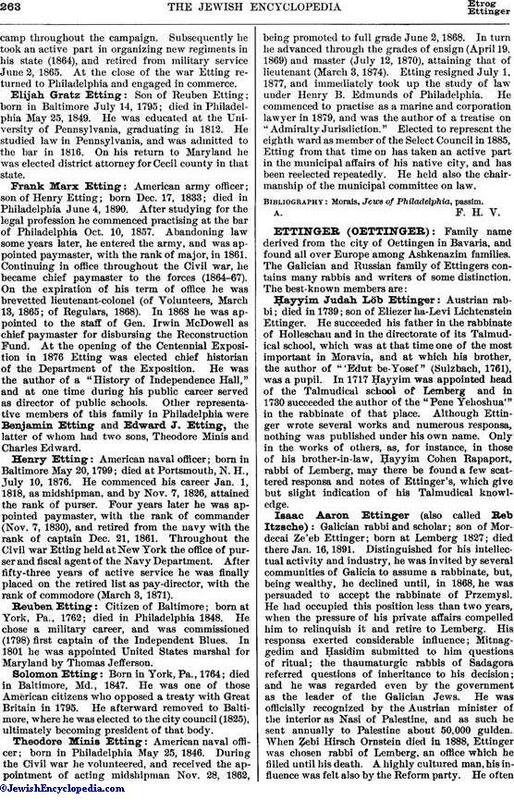 Galician rabbi and scholar; son of Mordecai Ze'eb Ettinger; born at Lemberg 1827; died there Jan. 16, 1891. Distinguished for his intellectual activity and industry, he was invited by several communities of Galicia to assume a rabbinate, but, being wealthy, he declined until, in 1868, he was persuaded to accept the rabbinate of Przemysl. He had occupied this position less than two years, when the pressure of his private affairs compelled him to relinquish it and retire to Lemberg. His responsa exerted considerable influence; Mitnaggedim and Ḥasidim submitted to him questions of ritual; the thaumaturgic rabbis of Sadagora referred questions of inheritance to his decision; and he was regarded even by the government as the leader of the Galician Jews. He was officially recognized by the Austrian minister of the interior as Nasi of Palestine, and as such he sent annually to Palestine about 50,000 gulden. When Ẓebi Hirsch Ornstein died in 1888, Ettinger was chosen rabbi of Lemberg, an office which he filled until his death. A highly cultured man, his influence was felt also by the Reform party. He oftenappeared in the Polish city council to uphold his opinions. Some of his responsa were posthumously published by his children under the title (Lemberg, 1892). Buber, Anshe Shem, p. 123, Cracow, 1895. Father of Isaac Aaron; born 1804; died June 30, 1863, at Lemberg. He published in collaboration with his brother-in-law, Joseph Saul Nathanson, the following: "Mefareshe ha-Yam" (Lemberg, 1827), a commentary to the work of his uncle, Moses Joshua Heschel, rabbi at Tarnogrod, who had published a work on Baba Kamma under the title "Yam ha-Talmud"; "Me'irat 'Enayim" (Wilna, 1839; Zolkiev, 1842); "Magen Gibborim," on the Shulḥan 'Aruk, Oraḥ Ḥayyim (part 1, Lemberg, 1834; part 2, Zolkiev, 1839); "Haggahot 'al ha-Shas" (printed in the Wilna Talmud ed. ); "Ner Ma'arabi," annotations to the Jerusalem Talmud (printed in the Jitomir ed. ); "Ma'aseh Alfas," on the . After a collaboration of twenty-five years a difference arose between the two brothers-in-law, which was brought to a crisis by Rabbi Solomon Klüger's "Moda'ah le-Bet Yisrael" in reference to the baking of maẓẓot by machinery, Rabbi Joseph Saul's answer, "Biṭṭul Moda'ah" (1859), not meeting with Ettinger's approval. 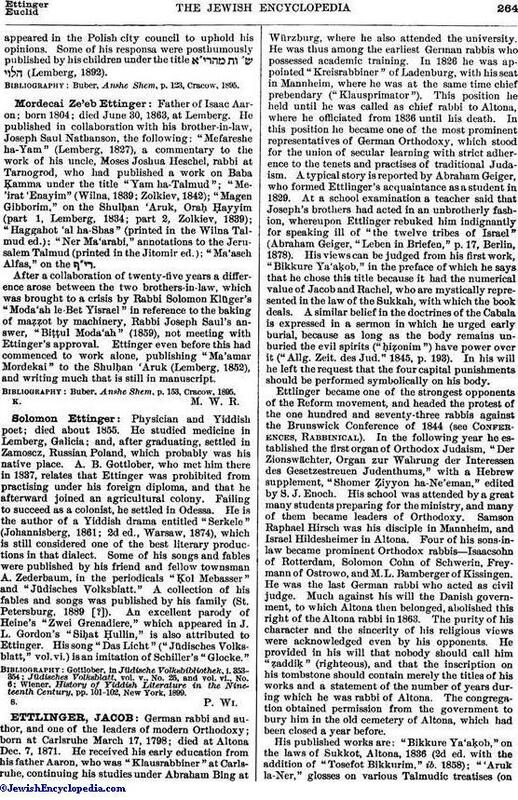 Ettinger even before this had commenced to work alone, publishing "Ma'amar Mordekai" to the Shulḥan 'Aruk (Lemberg, 1852), and writing much that is still in manuscript. Buber, Anshe Shem, p. 153, Cracow, 1895. Physician and Yiddish poet; died about 1855. He studied medicine in Lemberg, Galicia; and, after graduating, settled in Zamoscz, Russian, Poland, which probably was his native place. A. B. Gottlober, who met him there in 1837, relates that Ettinger was prohibited from practising under his foreign diploma, and that he afterward joined an agricultural colony. Failing to succeed as a colonist, he settled in Odessa. He is the author of a Yiddish drama entitled "Serkele" (Johannisberg, 1861; 2d ed., Warsaw, 1874), which is still considered one of the best literary productions in that dialect. Some of his songs and fables were published by his friend and fellow townsman A. Zederbaum, in the periodicals "Ḳol Mebasser" and "Jüdisches Volksblatt." A collection of his fables and songs was published by his family (St. Petersburg, 1889 [?]). An excellent parody of Heine's "Zwei Grenadiere," which appeared in J. L. Gordon's "Siḥat Ḥullin," is also attributed to Ettinger. His song "Das Licht" ("Jüdisches Volksblatt," vol. vi.) is an imitation of Schiller's "Glocke." Wiener, History of Yiddish Literature in the Nineteenth Century, pp. 101-102, New York, 1899.